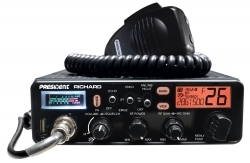 President's newest 10 Meter Radio ~ the "RICHARD"
Naples, FL, January 07, 2019 --(PR.com)-- President Electronics, the worldwide leader of CB Radios, announced today the launch of their newest 10 Meter radio the “RICHARD” arriving in North America later this month. The DIN sized RICHARD features a multi-function LCD 7 color display, built-in SWR Meter, Analog Signal Meter, USB Charging Socket, ASC, Scan, and more, at $179.00 retail. President's newest 10 Meter Radio ~ the "RICHARD"!